Good strong coffee. Strength - 11. A coffee that balances strength, spice and sweetness. Livewire is bursting with energy and liveliness. 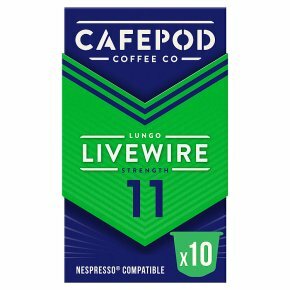 Livewire is our strongest Lungo, with a powerful nutty, fruity, and a chocolatey flavour. Nespresso® compatible capsules Contents: 10 capsules containing freshly roasted and ground coffee.